Sony Alpha Imaging Collective Member Gregg Jaden and his team will be leading an intensive Travel Photography Workshop to some of the most epic locations of Indonesia. You have the opportunity to experience towering cliffs, spectacular waterfalls, ancient temples and some of Indonesia’s most untapped landscapes. While we island hop, these locations have been meticulously scouted and prepared for you. This workshop is for anyone who loves to do easy hikes and take beautiful photos. You do not have to be a pro photographer. Even if you are beginner you will get the most from this amazing trip. The locations are easy enjoyable hikes like any tropical hike. Some of them we did in flip flops last year. All you have to do is show up with your gear and create as much as you can. Anyone who knows me knows my trips are always very well organized with thoroughly researched locations. *** This trip includes all domestic flights as we island hop while we explore some of Indonesia’s most beautiful landscapes together. To make it easy I will have everyone’s domestic travel arranged so we all travel together. All you have to do is get yourself to the designated international airport and the rest will be taken care of. I have assembled a team of Pros that will accommodate us through some of the most beautiful destinations of Indonesia. I have arranged my team to get us access to locations that only locals can get access to. You will be able to see parts of Indonesia that are more rare and only locals have access. If you have never been to Indonesia this will be an experience of a lifetime! Take advantage. My team are pros and their local knowledge of these mind blowing landscapes is unlike anything you will have ever experienced while traveling. My team are all pro photographers and can assist with compositions at each location. Strategically selected places have been heavily scouted and planned to help you get the most of your workshop. The costs include all of your domestic flights to each island locations but does not include your flight to and from Indonesia The participants cover costs to Indonesia and back home We cover the rest. Pack your gear - a detailed list of gear will be provided upon sign up. Book your flight to Jakarta or Bali - we will help coordinate with you on dates and times that work out with your 1st domestic flight to the first location. Meet up with the group and be ready for a life chancing experience. You will be flown from your destination airport (Jakarta or Bali) to our first location where you will be picked and brought to the group to get ready for Day One. Anyone who loves to travel and take photos and has a passion for epic landscapes. From beginners to pros It doesn't matter how good of a photographer you are. You will get the most from this workshop no matter what level of photographer you are. This workshop was created as an opportunity to learn, have fun, easy hike to locations and to make the most of your travel while taking photos for yourself portfolio. You will get to experience first hand what travel assignments are like and how to make the most out of each location. The itinerary has been planned to get the most time possible on location each day. We will adjust if needed for any change in weather. We have a massive location list every day giving you maximum opportunities to create the best shots and tell the best story you can. This workshop is an opportunity to work closely with Gregg, learning how I shoot fast while making the most of photography opportunities. Ill also touch upon storytelling showing you how to optimize your camera for grabbing footage along the way. Most of all how to captivate your audience using social media stories. Anyone that knows me knows I like to eat so don't worry the meals have been arranged and you will be fed like Kings and Queens. We will also be seeing some of the coolest traditional villages known to Indonesia and eating local fresh cuisine making friends along the way. I recommend landing in Jakarta or Bali before July 30th. We will coordinate your arrival with domestic flights to ensure you meet up with us as scheduled. Once we get a headcount my team will help you coordinate your flights to Bali or Jakarta trying to get everyone landing at a similar time. Once you land there will be domestic flight arrangements to meet at Day 1 location. If you want to land earlier and explore Jakarta and Bali on your own before the workshop no problems. We will help you coordinate that as well. Most of these place cant be put into words. When you see them you will probably be left speechless like I was. You will see the most incredible waterfalls, shoot above the clouds at volcano peaks, mega rays inside one of the worlds most amazing caves, mind blowing temples and so much, much more. I highly suggest you bring a ton of memory cards and empty your phone memory because you will become a shooting machine. Exclusive Class Size: This Indonesia Photography Workshop has a maximum capacity of 6 participants. With limited registration, you will enjoy attentive one-on-one instruction each day along with group coaching. I find the best teaching is coaching. We will be shooting together and working together to create the best visuals we can for each location. After I learn you styles I’ll help accommodate and improve on the areas you are looking to improve on. Back to hotel (breakfast). Id bring some protein bars for this morning shoot incase you feel hungry. Prambanan and/or Boko temple. Prambanan is a must see. If we have time after we will try to make it to Ratu Boko temple as well. This day is packed full however we start early and will be able to get a lot of shots for your portfolio. Arrive in Makassar – check in hotel. Catching the sunset at Losari Beach. This will be an epic place to drone or just shoot. Arrive Surabaya trip to Madakaripura Waterfalls (12.00 pm – 17.00pm). This day we will be going to Bukit Kapur and another tasty local lunch. I didn’t have time to shoot his place last time but its Epic and wanted to include it for you guys! We will spend the day speechless again although I’ll have to talk at some point. The falls here are incredible and the scale massive. We will go over shooting styles along with camera techniques to get the best photos for your portfolio. *** Rest and prepare for the shoot we start at 2AM to load up the Jeeps and drive up the mountain above the clouds. Preparations for shooting the sunrise at Mt Bromo and Tengger Semeru, Pasir Berbisik. This is where we take jeeps up the mountain to see volcano peaks from above the clouds. The only way there is by Jeep. We have a team assembled for your comfort and safety that know the way at night. Jeeps and safe knowledgeable drivers have been arranged and will be provided. There is a ton to shoot up there so be ready. Saving the Best for Last! When I first shot here I didn’t want to leave. I was speechless. It will be one of the best places you have seen ever! We will take you to ruly untouched areas of Surabaya. Tumpak Sewu and Kabut Pelangi. These gushing waterfalls will truly blow your mind. We will most likely have these places to ourselves. This shot below we had the place to ourselves all afternoon. Only a few people have access to these falls which we have arranged for us. We will be blessed meeting some of the kindest farmers there. Super kindhearted and you will love hanging with them while eating snake skin fruit called Salak. In the morning we will hike down into these falls. 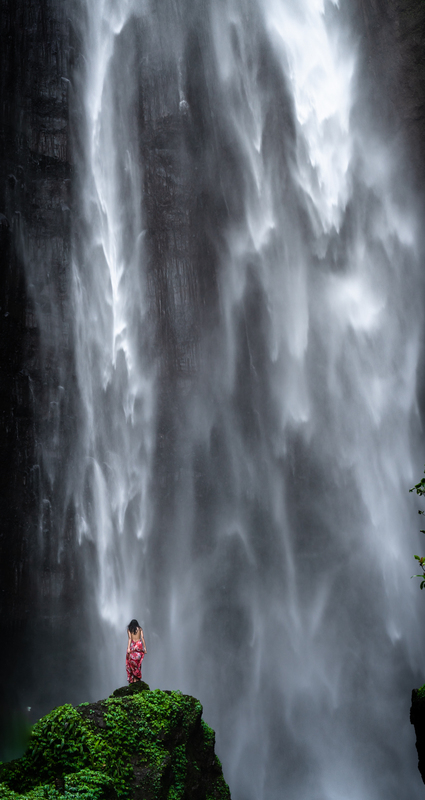 You will be surrounded by pure bliss as we catch all the angles surrounded by 350 feet high ribbon falls. Workshop end (17.00pm). Catch domestic flight back to Jakarta or Bali. Food (lunch, dinner, snacks) Drinks - usually we just all chip in cash for these items. It is very inexpensive to eat in Indonesia and we always have water wherever we go. Flights to and from Jakarta or Bali whichever you choose for your International destination airport. We will help you decide the easiest flight times for this schedule. What is NOT included is Airfare Travel to and from Jakarta or Bali *whichever you choose) and trip insurance. Please bring your own camera, digital DSLR full frame, or full frame mirrorless cameras are preferred. If you are a beginner I will teach you solid working knowledge of your camera and how to use it. Just give me a heads up what you shoot with so I can prepare. INSURANCE – Travel insurance is MANDATORY for you to have travel insurance for yourself. We also highly recommend insuring your photography gear. Tour leaders will not be responsible in the event of any personal injuries or damage to photography equipment as a result of an accident during the workshop. Most of the shooting locations on the Indonesia Photography Workshop are close to car parks and require very little hiking. Goa Jomblang Cave is easy now they lower you on a rope and provide a harness. They bring us up after we explore and get our shots. Any hiking to waterfalls will be an hour or two but usually basic hiking like any hikes. Some walking through shallow rivers but always on a path. There are lots of opportunities to swim at some falls if you want to cool off. Mount Bromo we will provide the jeeps and expert drivers to get us above the clouds. Once we arrive there is a small walk to where we shoot from. Upon sign up you will receive a list of other items you will need. Just small essentials for the trip and traveling in tropical climates.